In 2003 Frick entered into storage and handling agreements with major road salt producers. Eventually we signed an exclusive contract with a major salt producer. We now carry two grades of road salt, treated and untreated. The treated salt has a coating that lowers melting temperatures and in addition is environmentally friendly due to its adhesiveness to the roadway. Their additive allows the salt to adhere to the concrete and asphalt, thereby not spilling into the foliage along the highway causing environmental damage. Our supplier allocated us a small amount of salt which we marketed to a few small users. However, an overwhelming majority of the road salt our tenant sold went to state and local governmental agencies. We saw a need to supply salt to small business's that keep parking lots, sidewalks and driveways free of snow and ice. We then entered into contracts to purchase our own salt to supply this market. We entered into agreements to purchase salt, delivered by water transportation, which enabled us to economically supply bulk and bagged deicers. Frick Services currently is able to supply the market with salt in bulk, 50 pound bags and 1 ton super sacs. 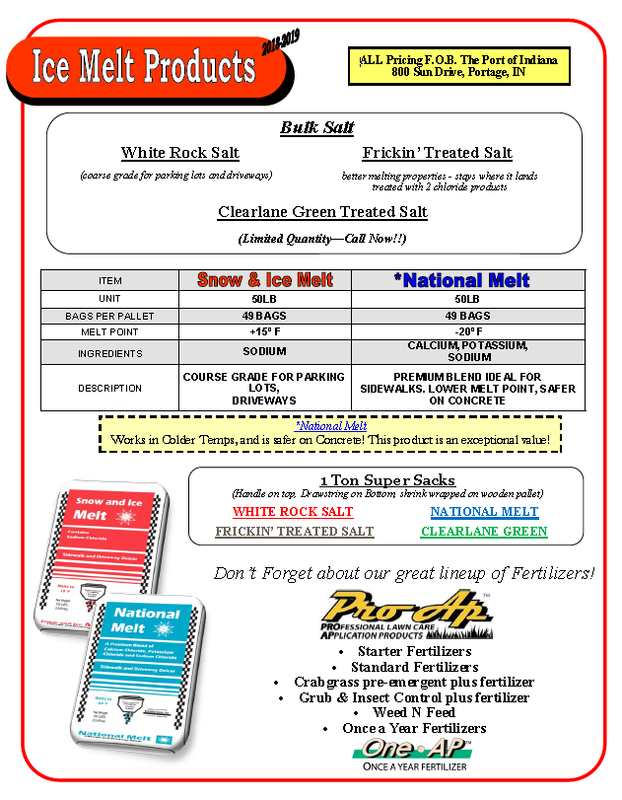 In addition, we supply salt with proven additives that melt snow and ice at temperatures below zero. Frick Services continues to search for opportunities to add to our product lines by innovatively using the Mississippi and great lakes water transportation systems to enhance our competitive position and better serve our customers. Contact Heidi Frick in the Wawaka office for information.